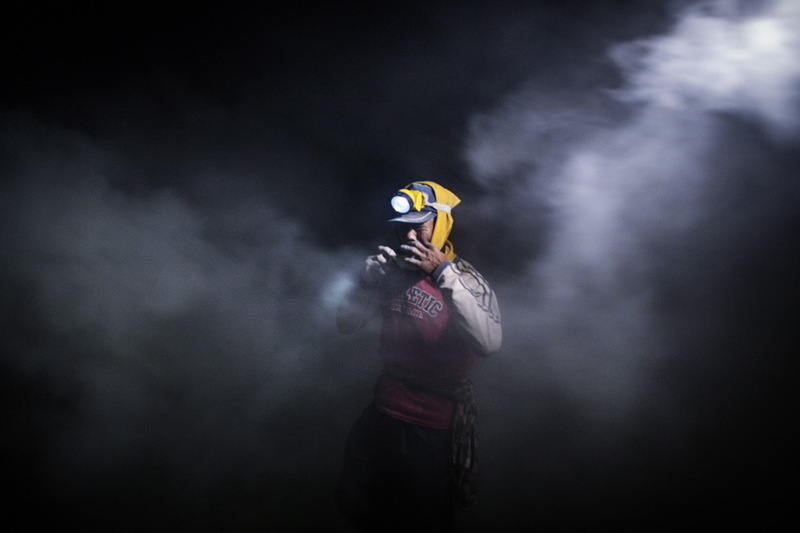 Inside the womb of the Ijen Kawah volcano, in Eastern Java, Indonesia, the miners go deep in search of the Devil’s gold, as sulfur has always been known. 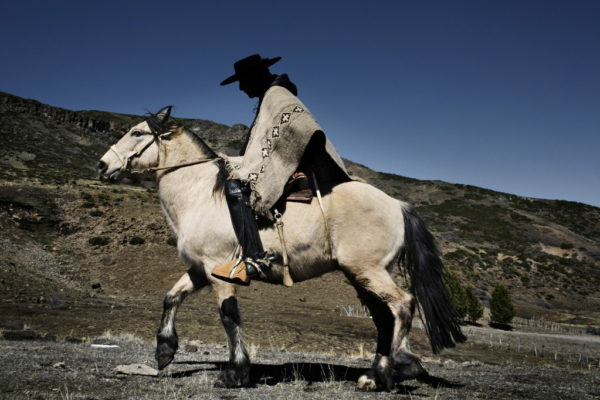 Every day, three hundred men leave the base camp at the slopes of the mountain to reach the top of the volcano. They climb up three kilometers and then head downwards until the opening of the crater where the sulfur crystals lie. Nine hundred meters deep towards hell, defying the unbearable heat, rarefied air and the darkness, without any protection. The sulfurs gas hits the throat, burns the lungs, makes tears spring from the eyes. 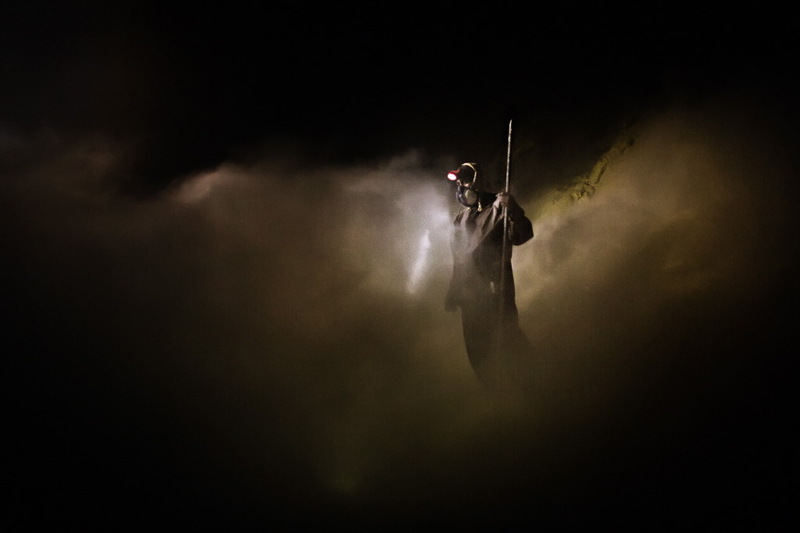 Only a few men have been given old gas masks as part of the scarce working gear: many prefer to work at night because the heat is more tolerable, putting a wet cloth in the mouth, in the vain hope of protecting themselves from the fumes and breathing better. 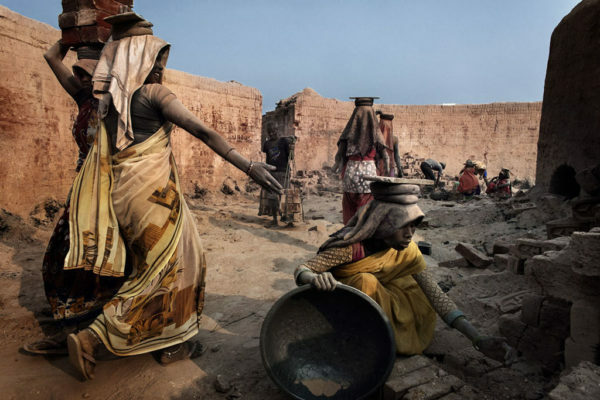 A very hard kind of work which will end soon – the average life expectancy of the sulfur miners does not go beyond 50 years. 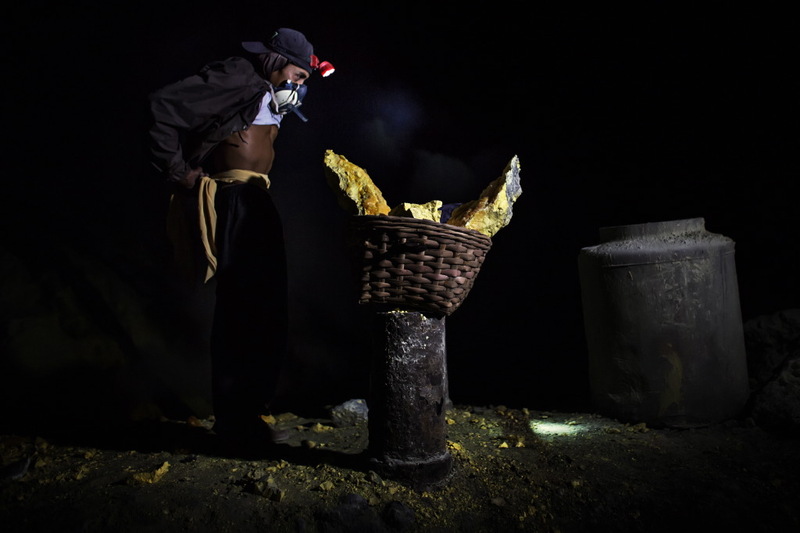 The sulfur slabs are broken with the help of a metal pole and then carried in reed baskets that weigh 70 to 90 kilos. Then begins the return path of the 21st century sulfur picker, heading towards the volcano’s entrance, in a precarious balance, carrying a huge load that deforms the spine, bends the legs and produces ulcers on his shoulders. Then he delivers the sulfur slabs for the purification process, which happens at night and lasts 14 hours. All this for 5 Euros per day, 10 if the miner is able to repeat the same path once more. (text by Luca Catalano Gonzaga). Ijen Kawah volcano, Indonesia. 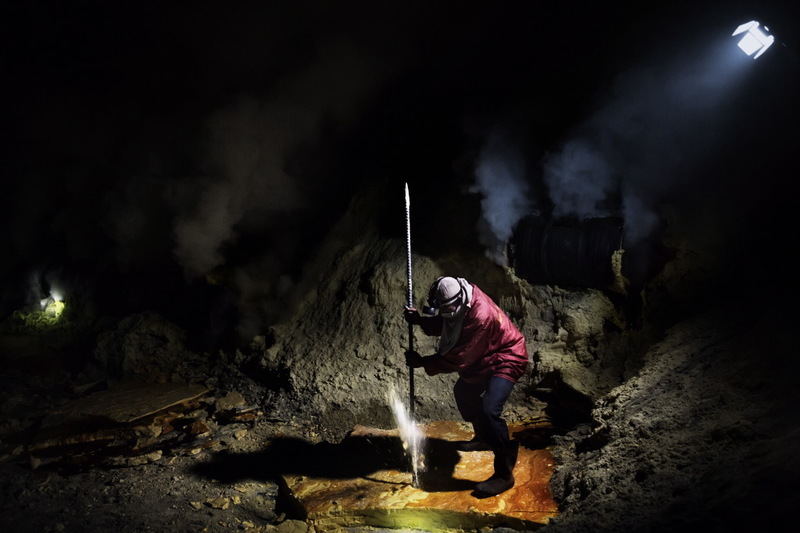 Alpan, 27 years old, a sulfur miner for ten years now, looks for sulfur slabs under the toxic fumes. 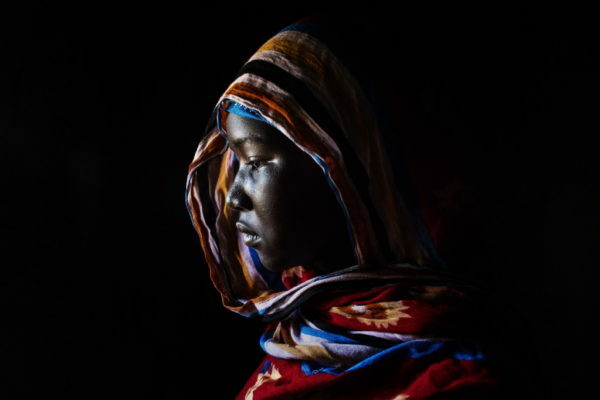 Every day, around 300 men leave the base camp carrying traditional equipment like torches and metal poles to break the sulfur slabs, though with little protective gear. Only a few men are given gas masks, while the rest rely on wet scarves or rags to cover their mouths, in a largely futile attempt to protect themselves from the caustic gas that burn the eyes, throats and lungs, and can even dissolve teeth. Ijen Kawah volcano, Indonesia. 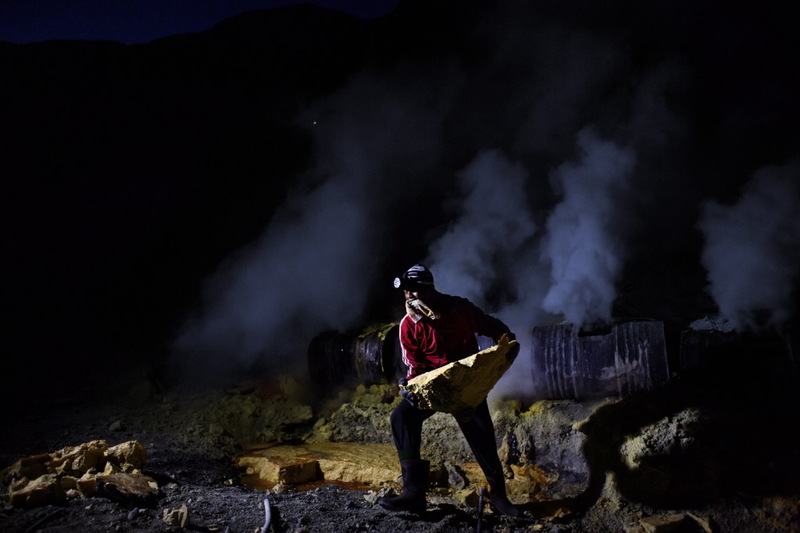 Mat Buang 39 years old, a sulfur miner for 20 years now, hardly breaths amidst the fumes as he searches for sulfur slabs. He protects his face with a wet cloth. This is how he tries to breathe amidst the toxic gases that burn the eyes, throats and lungs. Ijen Kawah volcano, Indonesia. 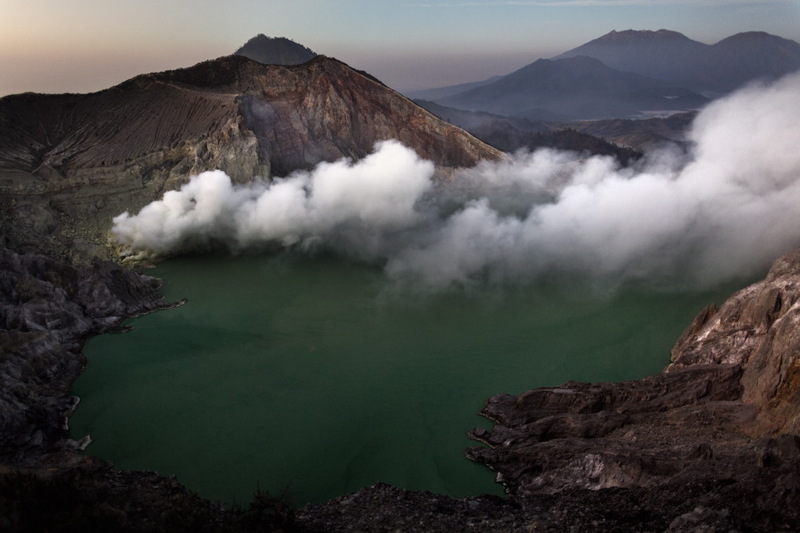 The sulfur mine near the island of Java, is active since 1969. It currently employs 300 miners who go deep facing an unbearable heat, the toxic fumes, and huge loads to carry for a fistful of euros. This mine produces 14 tons of sulfur per day, then exported to China and South-East Asia. Sulfur is very present in our daily life: it is used to refine sugar, to produce sulfuric acid, and it can be found in many products of regular use such as medicines, cosmetics, matches, fertilizers, insecticides and fungicides. Ijen Kawah volcano, Indonesia. 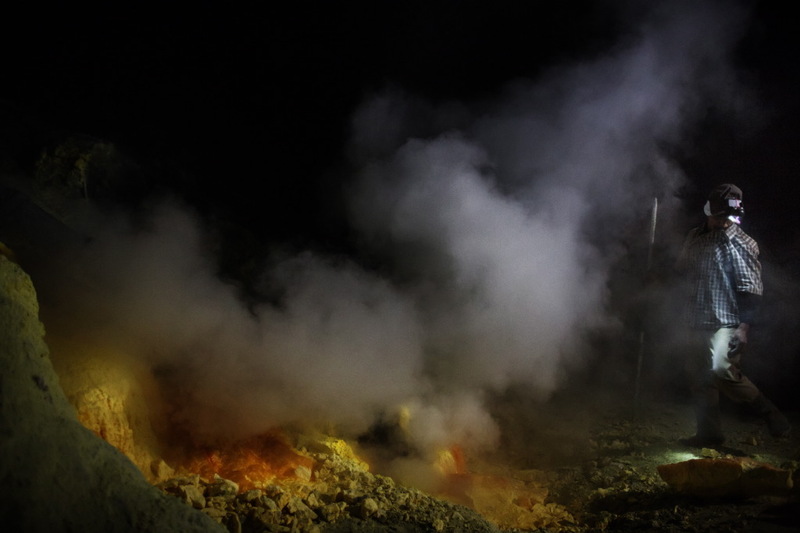 Poniman, 35 years old, surrounded by a sulfurus cloud, breaks the sulfur slabs using a metal pole. Working conditions are very hard, exacerbated by the unbearable heat. Ijen Kawah volcano, Indonesia. 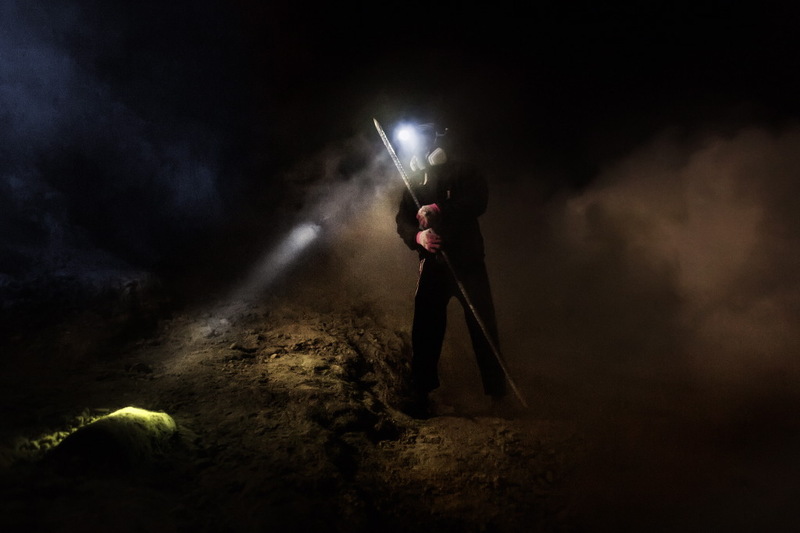 Ahmad, 44 years old, a sulfur miner for the past 25 years, uses an electric torch to lighten his path while carrying sulfur. Ijen Kawah volcano, Indonesia. Sumiati, 24 years old, searching for sulfur. 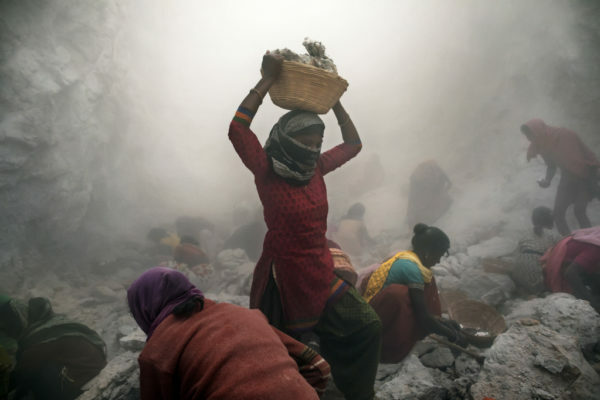 The miners descend to the womb of the volcano, defying scorching heat and rarefied air, in search of the precious material that is used to manufacture countless products from matches, rubber, insecticides and fertilizer to cosmetics, batteries, sugar and film. Ijen Kawah volcano, Indonesia. The mine of the Ijen Kawah volcano is run by a national company, the miners work on 4/5 times a week and are paid according to the load carried (5 Euro per 70 kg). Ijen Kawah volcano, Indonesia. Miners look for sulfur slabs. 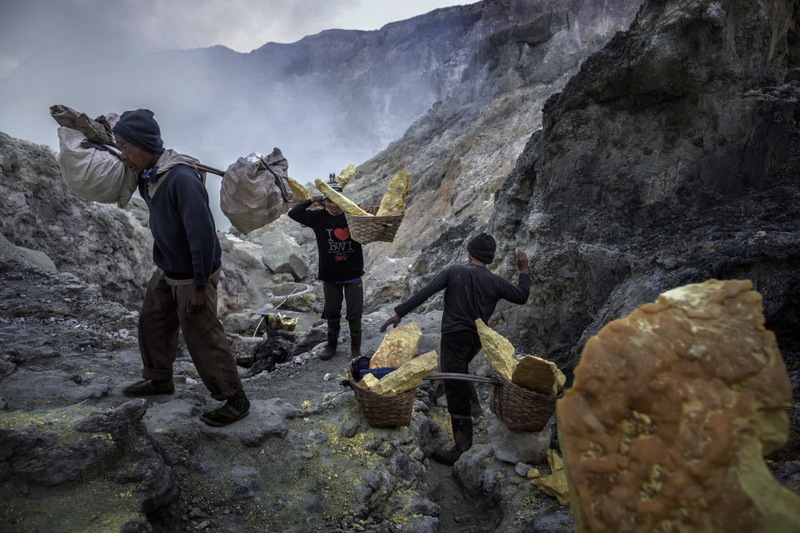 The mine of the Ijen Kawah volcano is run by a national company, the miners work on a daily basis and are paid according to the load carried (5 Euro per 70 kg). Ijen Kawah volcano, Indonesia. Mistar. 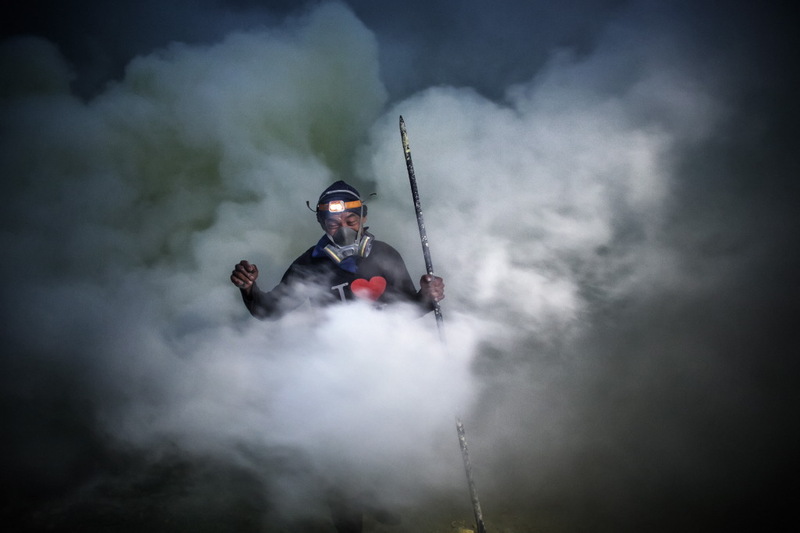 43 years old, a sulfur miner for the past 25 years, tries to find his way through the toxic fumes released inside the crater. Ijen Kawah volcano, Indonesia. 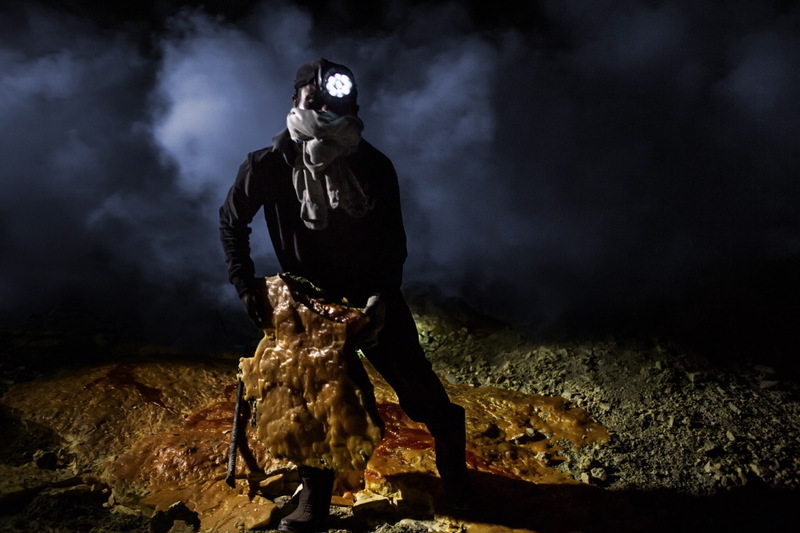 Sapiupin, 39 years old, a sulfur miner for the past 17 years, looks for sulfur slabs amidst the toxic fumes.The sulfur gases burn the lungs, the throats, the skin, the eyes and even dissolve teeth. Ijen Kawah volcano, Indonesia. 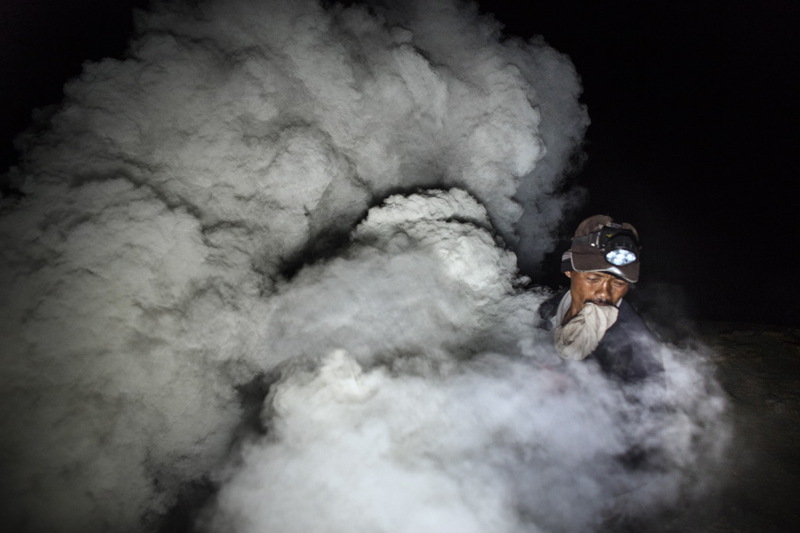 Samsuri, 31 years old, a sulfur miner for 12 years now, makes his way amidst the fumes. Only a few miners have been given old gas masks as part of the scarce working gear. Many prefer to work at night because the heat is more tolerable, putting a wet cloth in the mouth, in the vain hope of protecting themselves from the fumes and breathing better. Ijen Kawah volcano, Indonesia. 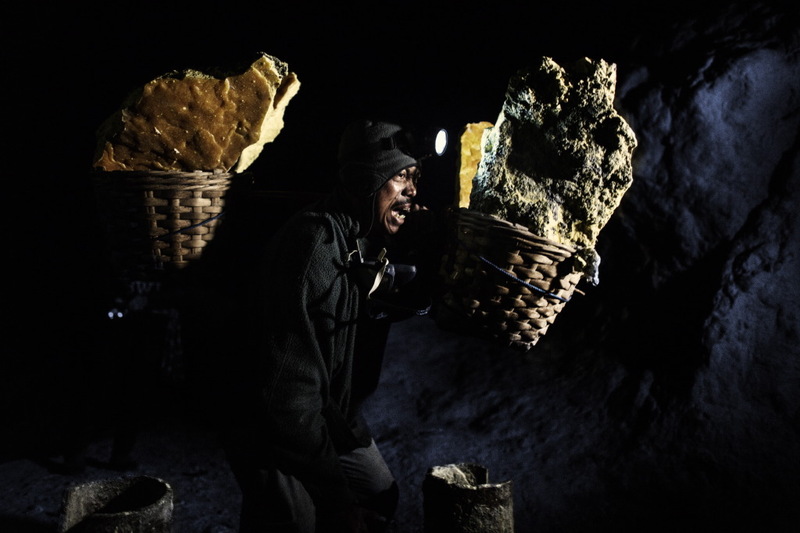 Murahman, 47 years old, a sulfur miner for the past 25 years, at work. The miners protect themselves from the fumes in a rudimentary way. Often they have only a torch and a pair of rubber boots as working gear. 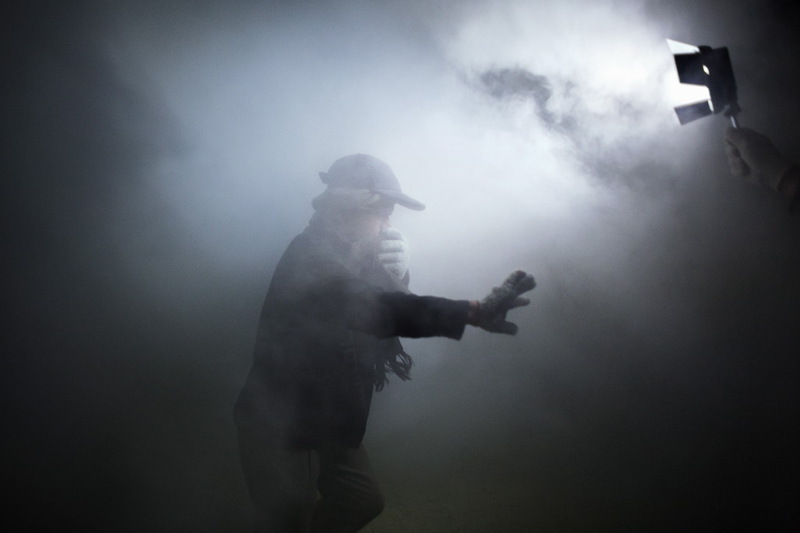 “We work in hell”, they keep saying, “our eyes and our lungs burn every day”. Ijen Kawah volcano, Indonesia. Sariman, a sulfur miner for the last ten years, looks for sulfur slabs. Ijen Kawah volcano, Indonesia. 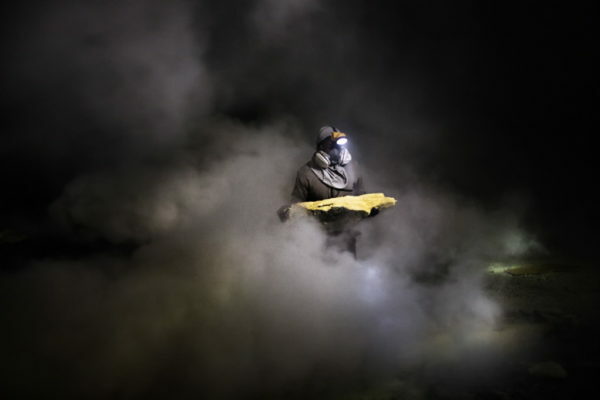 A sulfur miner looks for sulfur slabs under the toxic fumes. 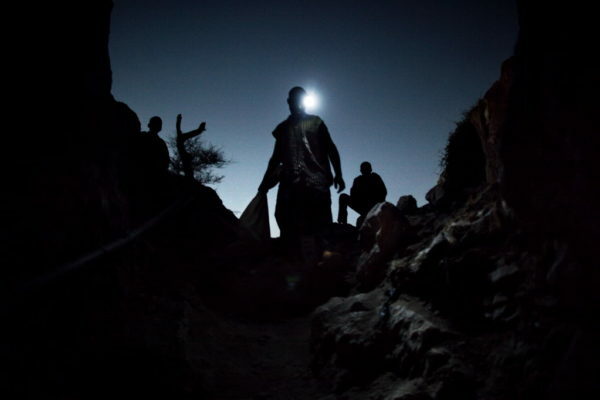 Most miners prefer working at night to avoid the suffocating heat during the day. Ijen Kawah volcano, Indonesia. 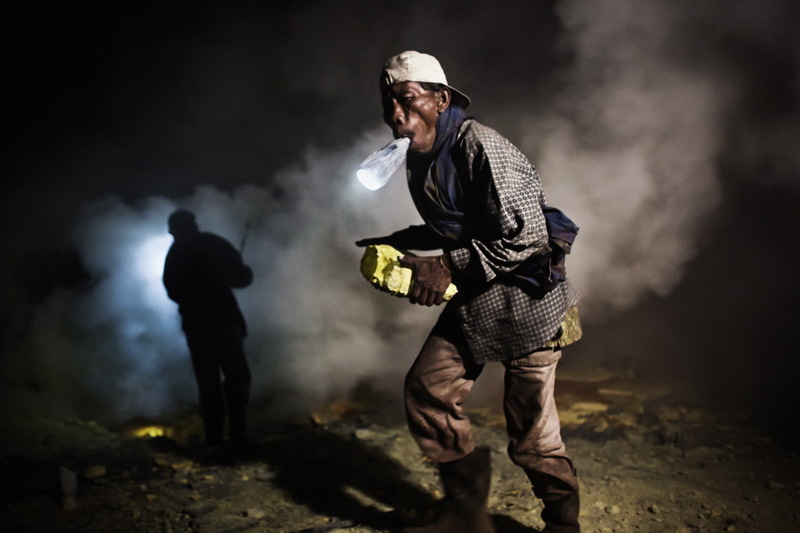 Mistar, 43 years old, a sulfur miner for the past 25 years, uses an electric torch to lighten his path while carrying sulfur. Ijen Kawah volcano, Indonesia. 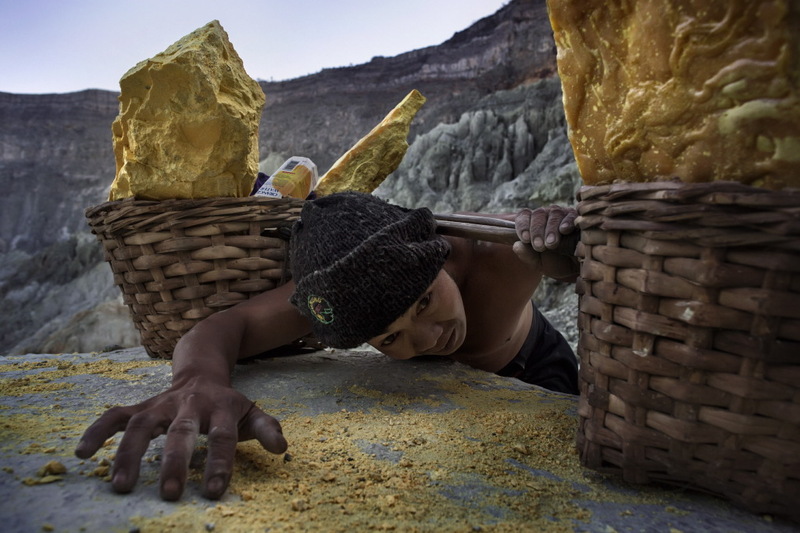 Muraksa, 29 years old, a sulfur miner, prepares for climbing up to the volcano’s crater with the load on his shoulders. It’s about two kilometres, that is an hour and half of climbing. Ijen Kawah volcano, Indonesia. 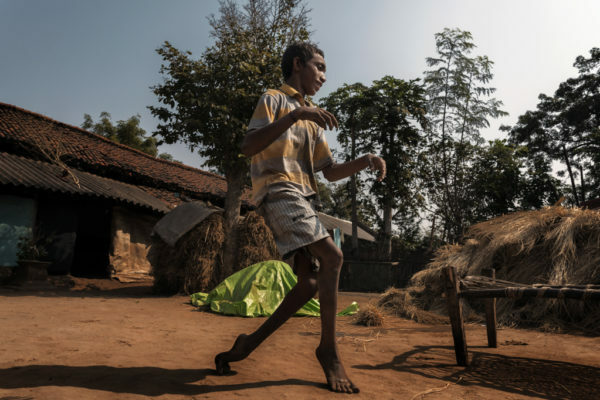 Mastari, 39 years old, a sulfur miner for ten years now, hardly walks under the overwhelming weight of the sulfur that he carries on his shoulders. Carrying 70 kg (150lb.) of sulfur, twice a day, earns him 140,000 rupiah ($11) but all this has a high price: a deformed back and bent legs. 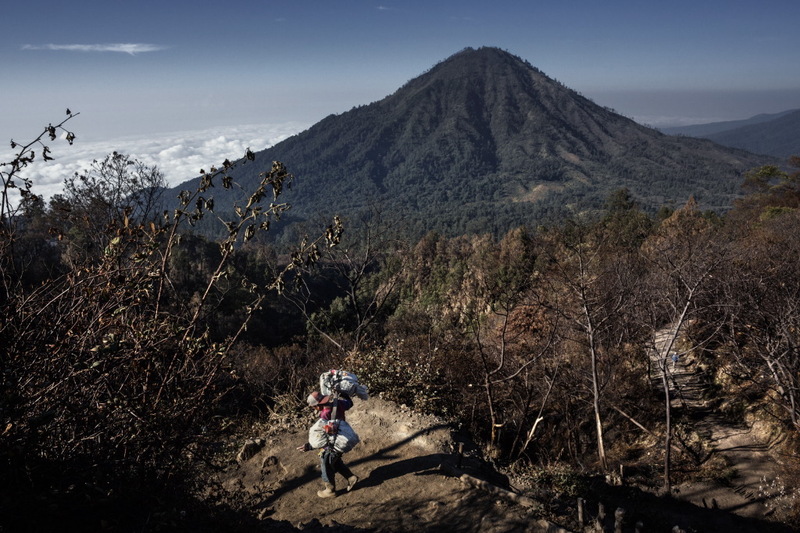 Every day, three hundred men leave the base camp at the slopes of the mountain to reach the top of the volcano. They climb up three kilometres and then head downwards until the opening of the crater where the sulfur crystals lie. Nine hundred meters deep towards hell, defying the unbearable heat, rarefied air and the darkness, without any protection. Ijen Kawah volcano, Indonesia. Hariyanto, 23 years old, a sulfur miner, with his wife Narya and doughter Pina. He works from 4 years, 2 times a day, 5 days a week, starting at 01 am to 07 am, no using mask, carrying 70 kg. of sulfur per trip. Ijen Kawah volcano, Indonesia. 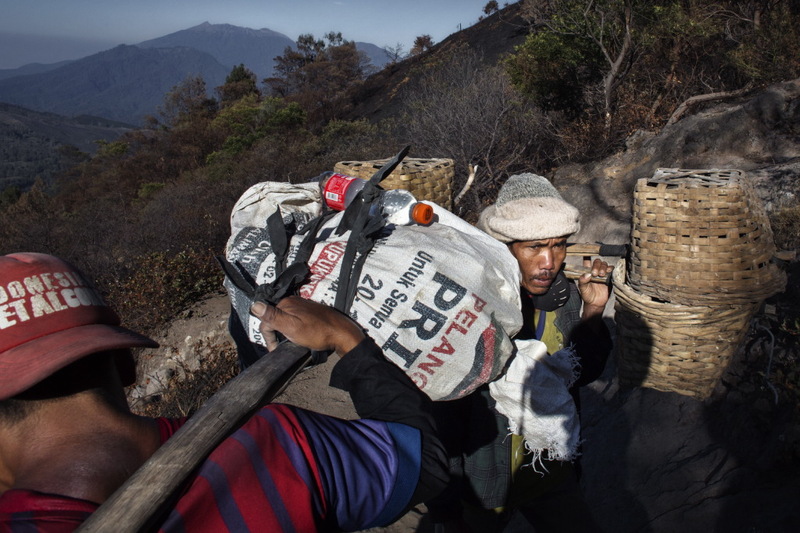 The load is weighed at the base camp, where this sulfur miner, is returning to be paid for the work done and for the quantity of sulfur collected. Ijen Kawah volcano, Indonesia. 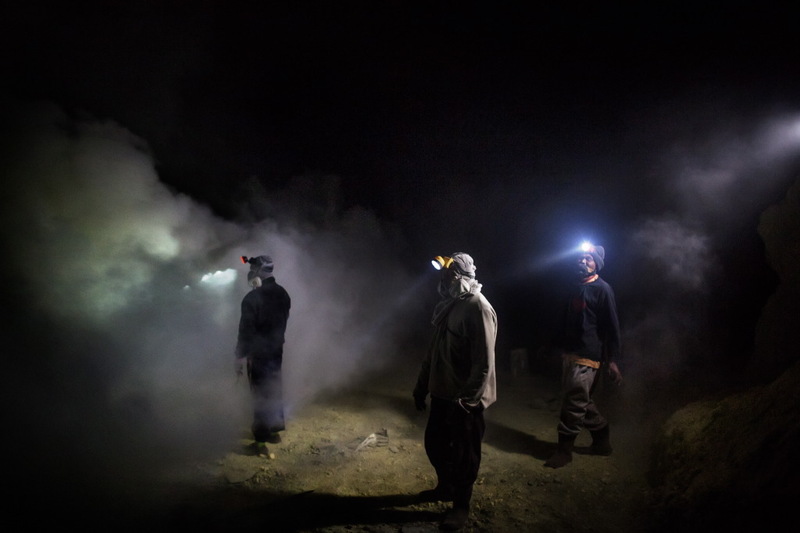 Sulfur miners on the path that leads to the sorting center. Ijen Kawah volcano, Indonesia. Sharon, 25 years old, a sulfur miner, takes a break and throws a pebble to a workmate for fun. Ijen Kawah volcano, Indonesia. 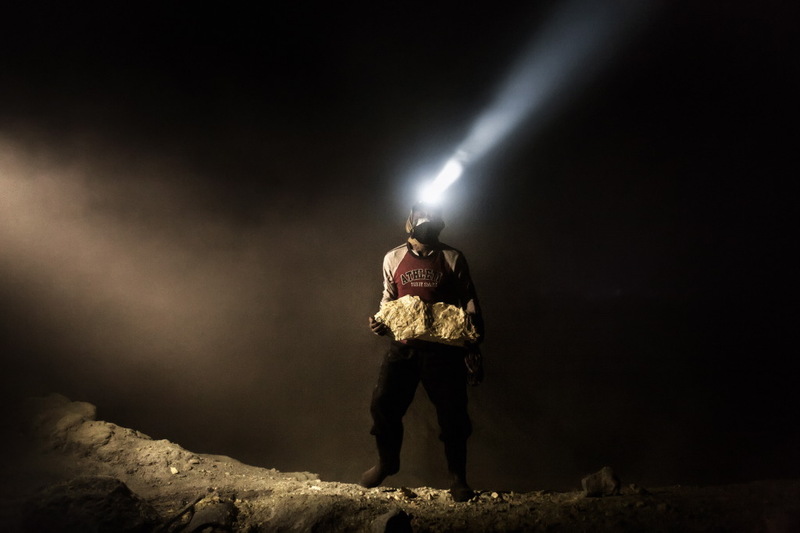 Sahron, 25 years old, half of which working in the mine, climbs the vulcano dayly with a load of almost 70 kg of sulfur carried in reed baskets. A path he makes twice a day for 10 euros. On his way up, he stops to catch his breath again and alleviate the pain caused by the overload carried. Once the miners collect their sulfur, they transport it, out of the crater, with baskets weighing between 70 kg (150 lb) and 90 kg (200 lb). When the base camp is reached, the sulfur plates are weighed and the fee is 10,000 rupees (78 ¢) for 10 kg (22 pounds) of sulfur. Ijen Kawah volcano, Indonesia. 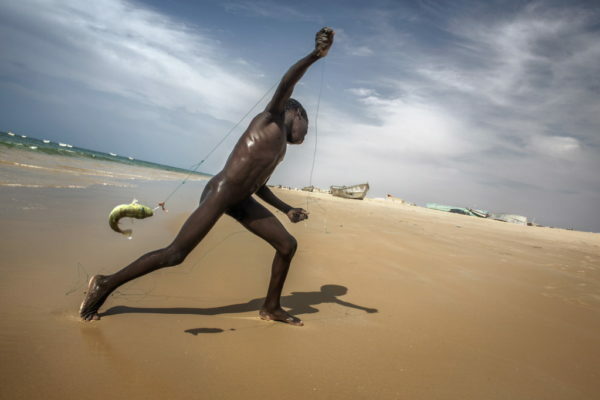 Sukari, 27 years old, shows how the overload has been affecting his back. 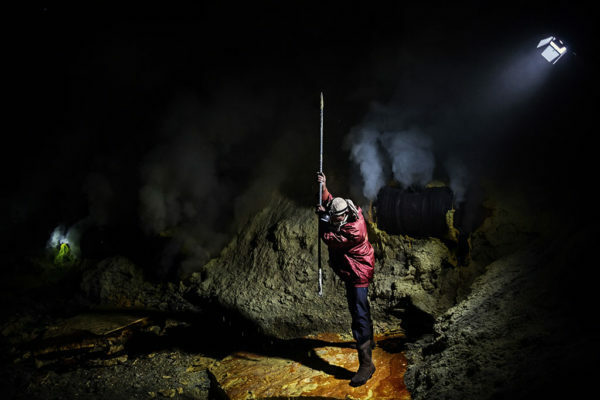 The sulfur extraction is an exhausting work, hazardous to the health as it causes excoriation on his shoulders, breathing diseases and spinal deformations due to the overload. The average life expectancy of a sulfur carrier doesn’t exceed 50 years. 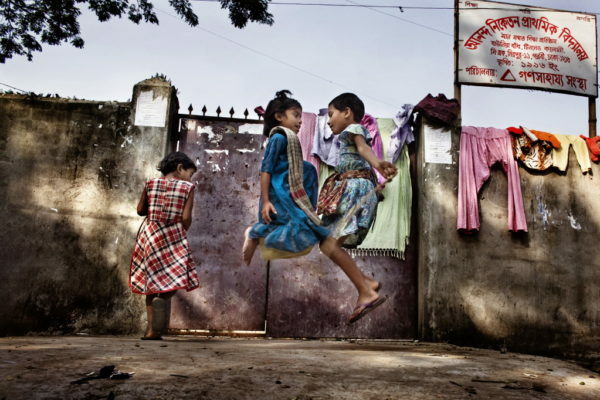 “The Devil’s gold” by Luca Catalano Gonzaga on Verve photo, the new breed od documentary photographers.